Gordon & MacPhail has released a collection of six vintage Glen Grant single malts from the 1950s for £10,000. 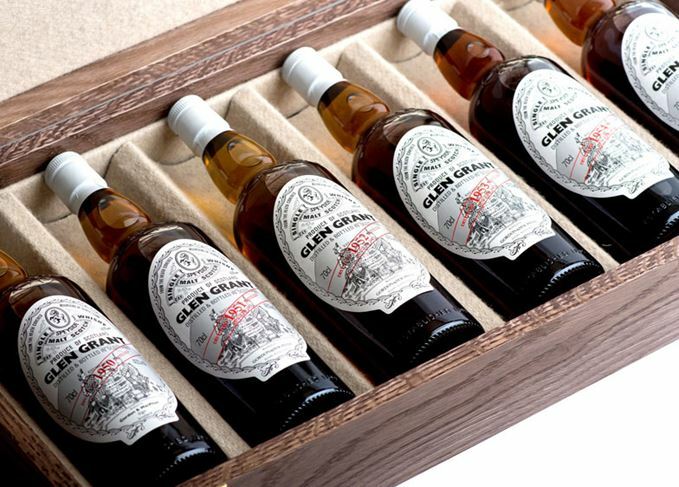 The Glen Grant Collection features whiskies distilled from 1950 to 1955, making them between 57 and 61 years old. During the 1950s the independent bottler sent casks to Speyside’s Glen Grant distillery to be filled with new make spirit, before maturing them under family ownership. Stephen Rankin, director of Gordon & MacPhail, said: ‘By creating this collection, we have captured a unique piece of Scotland’s liquid history. Just 75 sets of the Glen Grant Collection are available from specialist whisky retailers worldwide. The release follows the launch of Gordon & MacPhail’s £10,000 Distillery Labels Collection in December 2016, which featured six vintage bottlings from Glenlivet, Glen Grant, Strathisla, Mortlach, Longmorn and Linkwood. Distilled in 1948, the Glen Grant is thought to be the distillery’s oldest whisky ever bottled.